"We want to unify this world"
A UC Berkeley student's graduation speech has gone viral and is drawing praise from all corners of the world — and the Internet — for its message about acceptance and unity. 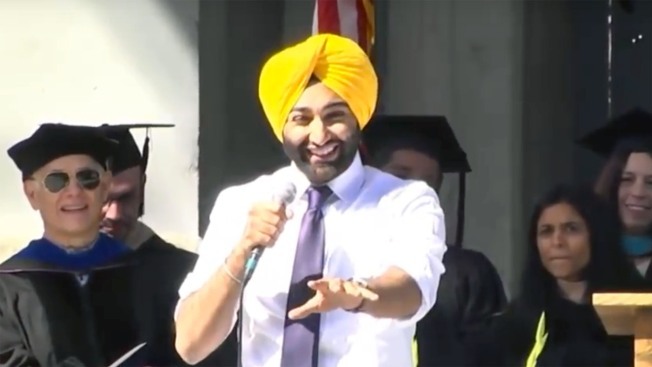 Angad Singh Padda, 23, who graduated in May from the university's prestigious Haas School of Business, struck a chord with his unscripted speech titled, "A Sikh's Graduation Speech to Unite the World." A video of the talk has been viewed close to 300,000 times on YouTube, and it's also been shared in various forms on Facebook, Instagram and Twitter. A video shared by UpWorthy has close to 2 million views alone. “We want to use our education to go beyond ourselves, to make the world a better place, we want to unify this world,” Padda, who comes from Punjab, India said in the speech. Padda, who was chosen to speak by fellow students, also spoke about losing two close friends to drug addiction in his home country. Success, he said, would enable him to return and fight the epidemic. Post-graduation, he will go to work at JPMorgan Chase & Co., a banking and investment firm. But it's not all about money, he cautioned: "I am not going to say, 'Let's go out there and earn six figures,'" he said. "I am going to say, 'Let's go out there and fix six of the world's biggest problems.'" Padda also took a jab at those who seek to divide the country along racial or religious lines, calling for a world with "no walls or borders" and where no one is called "bad hombre" because of where they were born — a thinly veiled reference to President Donald Trump. Watch the stirring speech below.